Accordingly, the analysis has been repeated for H-C≡S-OTf (OTf = triflate = trifluoromethane sulfonate), since the triflate would be expected to increase significantly the electron accepting properties of the S-O bond. One dramatic change has indeed occurred. Previously, a well-defined ELF disynaptic basin had been identified in the S-O region, with an integration of 1.12e. If the OH group is replaced by OTf, this disynaptic basin can no longer be located. 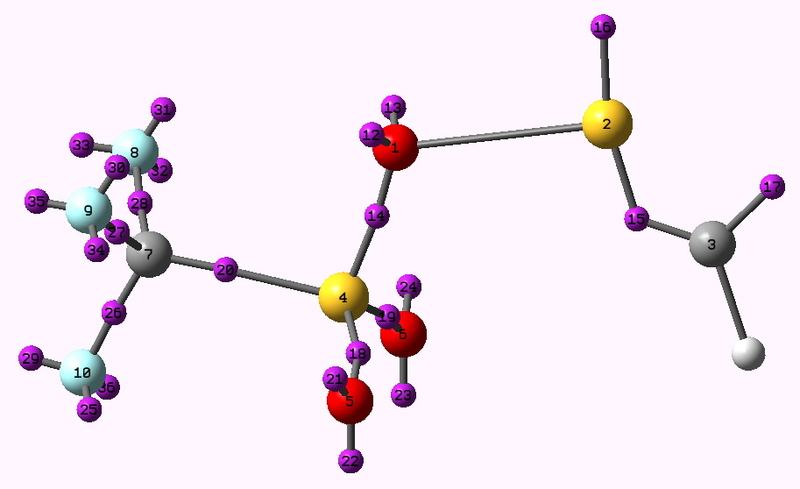 The electrons have instead moved into sulfur lone pairs, and the S-CF3 bond, which is an expected consequence of the greater electronegativity of the triflate group. Point 15 (the S=C region) integrates to 2.56e (compared with 2.36 for the OH analogue), and the carbon lone pair decreases from 2.01 to 1.86e. Taken as a whole, these changes suggest that the CS bond has gotten stronger, resulting from transfer of electron density from the non-bonding carbon lone pair, to the CS bond itself. Indeed, its length is now 1.492Å, a significant shrinkage compared to 1.544Å for the OH parent (B3LYP/cc-pVTZ). Likewise, the C-S vibrational stretch of 1381 cm-1 for the OTf derivative is an increase over 1215 cm-1 for the OH system and 1304 cm-1 for diatomic CS itself (B3LYP/cc-pVTZ). These results suggest that the ELF procedure, combined with the insight from the NBO analysis, can be used as a tool to rationally design a variation to the original molecule which does appear to enhance the triple bond character of the CS region, and to fulfil further the ambition of the original article by Schreiner and co-workers. As a triflate, it may even be susceptible to a simple preparation from the alcohol parent! Anyone up for it? It is also worth noting that the above system is headed off towards HC≡S+, the thioacylium cation (although crystal structures of the acylium ion are known, none have been reported for the thioacylium ion). Both N≡N and C≡O contract their bond lengths when protonated, so it should be no great surprise to find that CS does so as well (1.476Å, ν 1543 cm-1). This entry was posted on Saturday, December 5th, 2009 at 2:11 pm and is filed under Hypervalency, Interesting chemistry. You can follow any responses to this entry through the RSS 2.0 feed. You can leave a response, or trackback from your own site. As a follow-up to the post, the HC≡S-OTf system was noted to have a (gas phase) dipole moment of 5.6D, the result of shifting charge from the carbon lone pair to the S-OTf region. This dipole is the value at which solvation starts to have a discernible influence. Thus re-optimizing the geometry (B3LYP/cc-pVTZ/SCRF, DOI: 10042/to-3155) for a relatively non-polar solvent (benzene) is sufficient to induce the following changes: the dipole moment increases to 9.3D, the CS bond length decreases to 1.482Å, and the νCS stretch increases to 1424 cm-1. For a more polar solvent (dichloromethane, DOI: 10042/to-3157), the values continue this trend towards HCS+: 13.3D, 1.476Å and 1446 cm-1.